Lorsque les chercheurs du Centre pour la recherche en photonique de l’Université d’Ottawa (CRPuO) déménage au nouveaux Complexe de recherche avancée (CRA), ils aurons accès au facilité nessecaire pour propulsé la science de la lumière vers de nouveaux sommets. Le chef du centre, Dr. Pierre Berini , explique comment le CRPuO est afin de découvrir des nouvelles applications pour la recherche photonique. Pour plus amples renseignements, voir les liens ci-dessous. As researchers at the Centre for Research in Photonics at the University of Ottawa (CRPuO) move into the newly built Advanced Research Complex (ARC), they will have access to advanced facilities required to keep them at the forefront of photonics research. Dr. Pierre Berini, the Director of the center, explains how the CRPuO is discovering new ways to apply the science of light to practical applications. On May 28th 2014, TTBE partnered up with the Ottawa Network and You.i to build new relationships between local industry and the uOttawa research community. Take a look at our video below and contact TTBE to learn how your company can benefit from uOttawa research. This is designed to connect engineers in academia and industry working in a similar space, and help us to develop research programs that are relevant to the local community. There is no charge, and we will provide a light snack. The CanStep Adjustable Stairs helps physiotherapists decrease patient recovery times by allowing patients to practice finely adjusted stair heights. Louis Goudreau, an engineer at the Ottawa Hospital Rehabilitation Center designed the stairs to be more cost effective, reliable, durable and safer than similar commercially available designs. The resulting design is now currently in use by patients whose injuries prevent them from getting up flights of stairs. These stairs address one of the main concern’s that physiotherapists have in regards to their patients; their patient’s ability of safely getting in and out of their homes. With this new piece of equipment recovery can be accelerated through incremental physical training that begins with practicing a short step height, and eventually increasing the height as recovery progresses. In the video below, physiotherapists discuss the impact that this device is having on their patients. The team is now seeking commercial partners to help them commercialize the technology so that it can benefit patients beyond the scope of the Ottawa Hospital. The patent pending technology is available for license. For more information and any licensing inquiries check out the links below. L’escalier ajustable CanStep aide les physiothérapeutes à réduire le temps de récupération de leurs patients . Louis Goudreau , un ingénieur au Centre de réadaptation de L’Hôpital d’Ottawa a conçu les escaliers pour être plus fiable et moins cher que d’autres escaliers comparables . L’escalier est maintenant utilisé par l’hôpital d’Ottawa pour aider les patients avec des blessures qui les empêches d’accéder leurs domiciles. La réadaptions physique peut maintenant être accélérée grâce à la formation physique progressive utilisé avec ces escaliers ajustables. Le patient commence avec une hauteur de marche courte , et augmente la hauteur progressivement au cours de la réadaptation . VIDÉO: Yvon Boundriat, physiothérapeute au centre de réadaptation à l’hôpital d’Ottawa partage son témoignage de l’impact de ces escaliers sur la réadaptions physique dans notre vidéo ci-dessous. Les partenaires commerciaux sont maintenant invité à aider l’équipe de recherche à commercialiser la technologie afin qu’elle puisse être disséminer aux patients en dehors de l’hôpital d’Ottawa . Les licences pour la technologie sont maintenant disponibles. Pioneering work led by Dr. Kumanan Wilson led to the launch of ImmunizeCA — a smartphone app that puts critical vaccination and public health information at the fingertips of Canadians. ImmunizeCA provides access to vaccination schedules based on information specific to people’s home province or territory, and to reliable, expert-approved, bilingual information about vaccinations for children, adults and travellers. It also offers useful tools such as appointment reminders and local outbreak notifications. Six startups that have shared common connections with the OTTN and the University of Ottawa were featured in the Ottawa Business Journal last week. Their annual feature on Startups to Watch showcased ten promising start ups in the Ottawa area. Out of the ten companies, six share past relationships with the University of Ottawa. Exocortex has worked with Jochen Lang to bring new capabilities to their cutting edge 3D animation software that is now being used in large scale film production. Giatec Scientific was launched with the encouragement and financial support of the OTTN though our early PoP funding programs. Micrometrics, Proximify and Spoonity are all graduates of the Startup Garage, a program that provides cash, mentorship and support to student entrepreneurs. These companies join a 2013’s start-ups to watch that include iWatchLife, which is commercialising research arising from Robert Laganiere’s lab, and Gnowit, another Start-up Garage graduate. It is great to see this impact on the local economy. For more information and general resources related to industry collaborations, check out the links below. 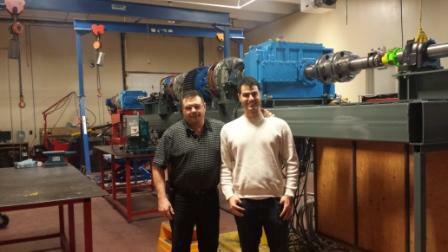 OTTN and uOttawa’s Technology Transfer and Business Enterprise Office (TTBE) is pleased to see Zec Windpower continue to achieve significant milestones in the development of their simplified wind turbine system that will provide advantages for the growing market for small scale electricity generation. After working with researchers at the University of Ottawa’s Faculty of Engineering, the company received a seed investment that has allowed them to hire recent graduates and students from the university, and build a large prototype in their new facilities. The company built a strong relationship with Dr. Riahd Habash of the School of Electrical Engineering and Computer Science, an expert in mechatronics, and energy and power engineering, as well as with Dr. Ming Liang of the Department of Mechanical Engineering, an expert in vibration analysis and control, and other forms of non-destructive testing. TTBE helped the company make the most of their research collaborations through helping them to secure funding for the collaboration from sources such as NSERC Engage, SME4SME, and the Ontario Centres of Excellence. The students involved in the project also received entrepreneurship training through TTBE and Faculty of Engineering programs, making them ideal hires for this start-up company. The company (formerly Trias Innovation) has turned the output of the research collaboration into a seed investment that resulted in the formation of Zec Wind Power. Their new indoor demonstration unit located in Ottawa, Canada has demonstrated that they can provide a cost of energy that is 18% lower than the competition, and brings them within range of the cost of natural gas electrical generation at just under 10 cents / KWh. They are now starting to prepare the company for the next financing round so that they can build an outdoor demonstration unit, which is key towards them turning their expressions of interest from potential customers into purchase orders. We look forward to following their progress, and uOttawa is proud to be a part of their success so far. For more information on the resources related to this project, and general resources related to industry collaborations, check out the links below.